0.8 RC7 (March 8, 2009). 9 years 26 weeks ago. Viscacha is a free bulletin board system integrating a content management system (CMS). It supports plugins (called 'packages') in order to extend the possibility of the basis system. Viscacha is recommended for Medium Community. Some details about Viscacha features regarding members. 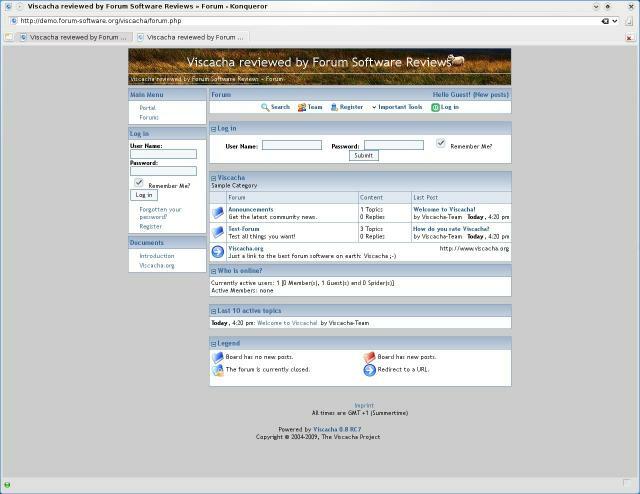 Convert an existing forum to Viscacha. Does Viscacha correctly follow (X)HTML and CSS norms? Viscacha is a really surprising and interesting forum software. It could appeared as minimalist, but provides tons of features, that we do not see everyday, even on big forum softwares that take main market share. This bulletin board is a really good software, even if some little bad points prevent it to have a 4 stars level. We could for example notice that the German origin of the software is still present on the main release (usergroups are not translated), or the FTP buggy step of the installer, that require a valid FTP address, even if we already are on the remote server. Compare Viscacha vs PhpBB 3 vs Simple Machines 2. Ask your questions to the Viscacha Community Forum. Get Users Reviews about Viscacha and Share your experience.